In summer camps, a camp transportation vehicle is an essential part of the program. This allows the campers to reach their destination based on the camp activities. It will reassure their safety because the facilitators and counselors will be present in the vehicle. 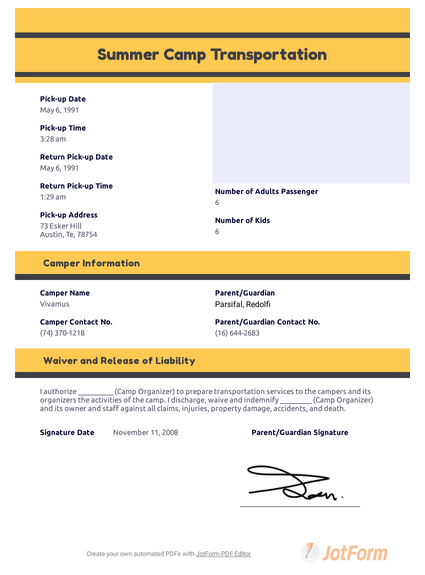 This sample camp transportation template asks for information about the camper, parents/guardian, and transportation details. It also has a waiver and release of liability section that requires a signature from the parent/guardian. You can use the JotForm's PDF Editor if you want to customize the template to your preferences. After that, you can print it and share it to the parent/guardian and to the camp organizer. I authorize __________ (Camp Organizer) to prepare transportation services to the campers and its organizers the activities of the camp. I discharge, waive and indemnify _________ (Camp Organizer) and its owner and staff against all claims, injuries, property damage, accidents, and death.